The London 2012 Summer Olympics has formally began with the grand opening ceremony. 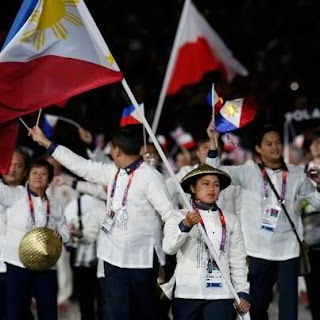 Along with the parade of colors are the 11 Filipino athletes who will compete in different sport events like archery,athletics,boxing,cycling,Judo,shooting, swimming and weightlifting. Filipino weightlifter Hidilyn Diaz holds the national flag as she leads the Philippine contingent in the athletes parade during the opening ceremony of the London 2012 Olympic Games. The uniforms were designed by renowned fashion designer Rajo Laurel. In the recent poll, among the sport events, the hope to grab gold is more positive in the boxing and athletics. We'll found out! TV5 via INTERAKTV got the rights to air the events in the Philippines. They will bring London closer to our eyes. Nowadays, it's very difficult to get Youtube videos in relation to Summer Olympics. Only the videos or with copyright from IOC are allowed. Anyway, here's the schedule of activities of Pinoy athletes to be broadcasted in AKTV Channel 13 and in HD subscription. 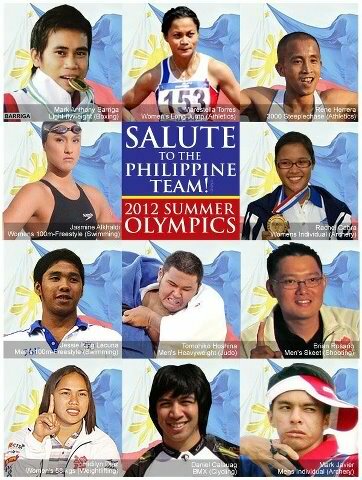 The whole Philippines is in support to our athletes and we pray for their success.